Alan M. Nathan, American Journal of Physics 68, 979-990 (2000). This paper develops a dynamic model for wooden bats, taking into account their vibrational properties. The model is then used to describe the collision between bat and ball. Based on the preliminary version of this paper, Jeremy Manier wrote an article Science has a Sweet Spot for Baseball that appeared in the April 3, 2000 issue of the Chicago Tribune (front page, above the fold! ), which features an interview with me about the bat-ball collision. Alan M. Nathan, American Journal of Physics 71, 134-143 (2003). (a) usual field frame and the (b) bat rest frame. This article defines a set of laboratory measurements that can be performed on a bat and then used to predict performance in the field. 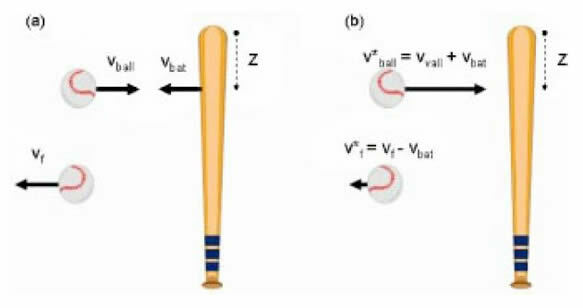 Using a computational model, it is shown that bat performance depends on the interplay of the elasticity of the ball-bat collision, the inertial properties of the ball and bat, and the bat swing speed. This paper is the foundation for modern efforts to regolate the performance of non-wood bats. Rod Cross and Alan M. Nathan, American Journal of Physics 74, 896-904 (2006). This paper reports on an experiment to study the spin resulting from a low-speed ball-bat collision. The data are relevant for determining whether a hit curveball has more backspin than a hit fastball. Click here to see a short video clip of the experiment in action. That handsome fellow holding the bat is Rod. Rod Cross and Alan M. Nathan, American Journal of Physics 75, 658-664 (2007). Alan M. Nathan, American Journal of Physics 76, 199-224 (2008). Forces on a baseball in flight. In this paper I report on an experiment to measure the quantitative effect of spin on the flight of a baseball. This topic has relevance for the movement of pitched baseballs as well as on the trajectory of a batted baseball. A talk based on this work was presented at the IMAC XXIV Meeting of the Society of Experimental Mechanics, January 30, 2006. A presentation based on this work entitled "Baseball aerodynamics: What do we know and how do we know it?" was presented at the SABR36 convention in Seattle (June 2006). A presentation based on this work entitled "The Flight of a Baseball" was presented at the March 2010 APS meeting. Michael. K. McBeath, Alan M. Nathan, A. Terry Bahill, and David G. Baldwin, American Journal of Physics 76, 723-729 (2008). Example of a paradoxical popup. This paper examines the unusual trajectories of towering popups with lots of backspin. It is shown that the normal strategy used by outfielders to intercept fly balls leads to systematic vacillation in running paths for these popups. One example is shown in the animation. For another example, take a look at this video taken from a Red Sox vs. Tampa Bay game on September 15, 2008. Note the third baseman Kevin Cash (normally a catcher) overruns the ball, which initially was headed toward the seats along the third baseline but then veers back towards the field. This is the quintessential paradoxical popup, indicative of a lot of backspin on the ball. Note also what happens to the ball when it hits the ground. The backwards bounce is further indication of large amount of backspin on the ball. Rod Cross and Alan M. Nathan, Sports Technology 2, 7-15 (2009). by Rod Cross and myself (Sports Technology, vol. 2, pp 7-15, 2009). It is shown that for a given coefficient of restitution (COR), both the intrinsic power and the swing speed of a tennis racquet or baseball bat correlate strongly with the MOI about an axis through the handle and only weakly with the mass. Lloyd V. Smith, Alan M. Nathan, and Joseph G. Duris, Sports Engineering 12, 163-169 (2010). Alan M. Nathan, Lloyd V. Smith, Warren L. Faber, and Daniel A. Russell, American Journal of Physics 79, 575-580 (2011). Three questions of relevance to Major League Baseball are investigated from a physics perspective. 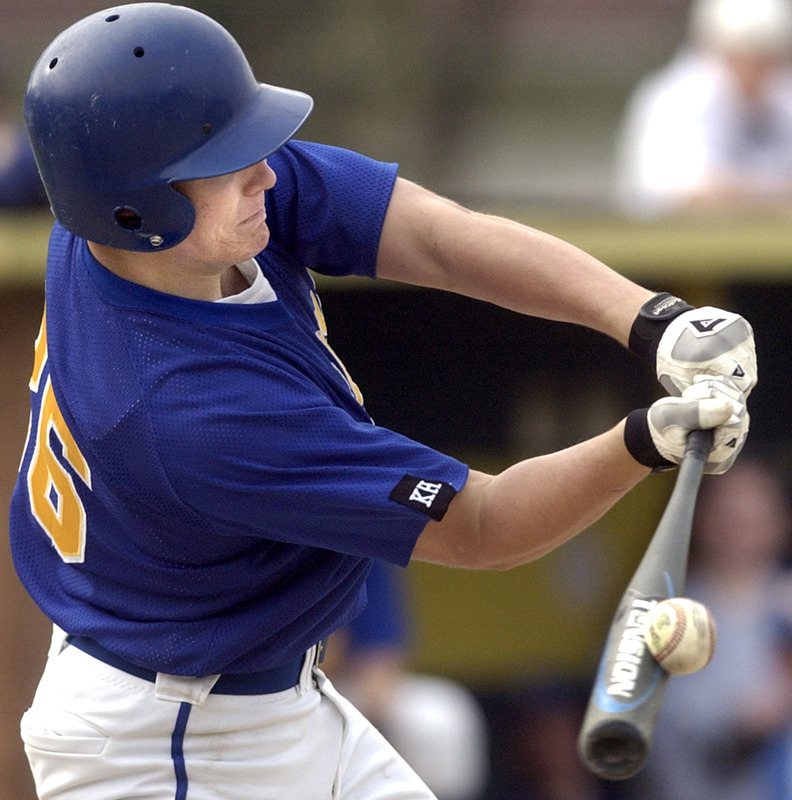 Can a baseball be hit farther with a corked bat? Is there evidence that the baseball is more lively today than in earlier years? Can storing baseballs in a temperature- or humidity-controlled environment significantly affect home run production? These questions are subjected to a physics analysis, including an experiment and an interpretation of the data. The answers to the three questions are no, no, and yes. A very nice popularized summary of the paper was written by Chris Solomon and appeared in Smithsonian Magazine in June, 2011. Alan M. Nathan, J. J. Crisco, R. M. Greenwald, D. A. Russell, and Lloyd V. Smith, Sports Engineering 13, 153-162 (2011). Alan M. Nathan, Lloyd V. Smith, and Warren L. Faber, Sports Technology 4, 19-28 (2012). A new technique is described to normalize the performance of a bat to the coefficient of restitution and stiffness of the baseball or softball used to measure the performance. The technique is developed theoretically and tested experimentally. It is shown to be vastly superior to a different normalization technique that has been popolarly used. David Kagan and Alan M. Nathan, The Physics Teacher 52, 278-280 (2014). Techniques are described to determine the drag coefficient from PITCHf/x data. These techniques shoold be suitable for classroom instruction in introductory physics courses. David Kagan and Alan M. Nathan, The Physics Teacher, 55, 134-136 (2017). A tool is presented for calculating trajectories of baseballs and used to analyze a home run hits by Alex Rodriquez in 2015. Jeffrey R. Kensrud, Alan M. Nathan, and Lloyd V. Smith, American Journal of Physics, 85, 503-509 (2017). Oblique impacts of a swinging bat with a stationary ball are performed and the resulting velocity and spin of the batted ball are measured. The results are analyzed in the context of a ball-bat collision model and the parameters of that model are determined. Lloyd Smith, Jeff Broker, and Alan Nathan, Sports Dynamics Discovery and Applications, eds. A. Subic, P. Trivailo, and F. Alam, RMIT University, Melbourne Australia, pp. 12-17 (2003). This presents the results of a 2002 field study sponsored by the Amateur Softball Association. The data show that the swing speed of a typical player is inversely related to the bat moment of inertia about the handle (with a fixed bat weight) and nearly independent of the weight of the bat (at fixed moment of inertia). Alan M. Nathan, Daniel A. Russell, and Lloyd V. Smith, The Engineering of Sport V, eds. M. Hubbard, R. Mehta, and J. Pallis, UC Davis, Davis CA, pp. 38-44 (2004). Proceedings of 5th ISEA Conference, Davis CA, September 2004. Toy model for the trampoline effect. This paper presents a simple physical picture of the "trampoline effect" in hollow bats and demonstrates how the effect leads to a larger coefficient of restitution. A special section presents new data showing there is no measureable trampoline effect with a corked bat. This paper was presented at the September 2004 meeting of the International Sports Engineering Association in Davis, CA. A. M. Nathan and L. V. Smith, 4th Asia-Pacific Congress on Sports Technology, Honololu, Hawaii, The Impact of Technology on Sport, 257-262 (2009). This paper presents a simple physical model relating the ball-bat coefficient of restitution (BBCOR) to the ball COR and stiffness. Using the model, a technique is developed to normalize the BBCOR to a standard ball. This paper will be presented at the 4th Asia-Pacific Congress on Sports Technology (APCST2009) in September 2009 and was published in the proceedings. Alan M. Nathan, Procedia Engineering 34, 116-121 (2012). Proceedings of 9th ISEA Conference, Lowell MA, Joly 2012. An analysis of knuckleball trajectories is presented using data from the PITCHf/x video tracking system for pitches thrown in actual MLB games. The data reveal that, contrary to popolar belief, knuckleball trajectories are as smooth as those from normal pitches. However, the data also show that the deflection of a knuckleball from a straight-line trajectory is essentially random in both magnitude and direction. Alan M. Nathan, Jonas Cantakos, Russ Kesman, Biju Mathew, and Wes Lukash, Procedia Engineering 34, 182-187 (2012). Proceedings of 9th ISEA Conference, Lowell MA, Joly 2012. 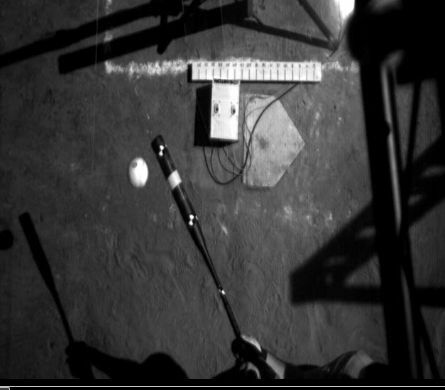 Experiments are conducted to investigate the spin of a baseball undergoing an oblique collision with a bat. A baseball was fired horizontally at speeds up to 120 mph onto a 3"-diameter cylinder of wood that was rigidly attached to a wall. In one experiment, a two-wheel pitching machine was used in which the backspin or topspin of the incident ball coold be adjusted. In another experiment, an air cannon was used to project the ball with no spin. In both experiments, markers on the ball were tracked with high-speed video to determine the velocity and spin vectors, before and after the scattering. Our primary results are as follows: (1) For a given angle of incidence, the scattered spin is nearly independent of the incident spin; (2) The spin of the scattered baseball is considerably larger than expected for a model whereby the ball rolls before leaving the surface. Implications for the spin of batted baseballs are explored. Alan M. Nathan, Proceedings of the EuroMech Physics of Sports Conference, Paris, April 2012 (to be published). for balls hit in the velocity range shown in the legend. The trajectory of a baseball moving through the air is very different from the one we teach in our introductory classes, in which the only force is that due to gravity. 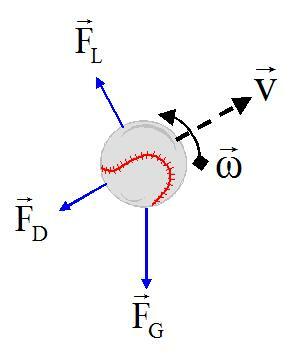 In reality, the aerodynamic drag force (which retards the motion) and the Magnus force on a spinning baseball (which causes the ball to curve) play very important roles that are crucial to many of the subtleties of the game. Despite their importance, our knowledge of how these forces affect the flight of the baseball has been qualitative at best. Recently, however, new tools have been developed for measuring accurate baseball trajectories during an actual game. These tools include both video tracking (the PITCHf/x and related systems) and the TrackMan Doppler radar system. In this article, I will discuss these new tools and give some examples of what they are teaching us about the game of baseball. Jeffrey R. Kensrud, Lloyd V. Smith, Alan Nathan, and Derek Nevins, Procedia Engineering 112, 406-411 (2015). Proceedings of the 7th Asia-Pacific Congress on Sports Technology APCST 2015. A. M. Nathan, Scientific American 277, 102-103 (1997). Home Runs and Humidors: Is There a Connection? Global Warming and Home Runs: Is There a Connection? How Far Did That Fly Ball Travel? Alan M. Nathan, The Hardball Times Baseball Annual 2014. Testing TrackMan: Just How Well Does TrackMan Work? Alan M. Nathan, Lloyd Smith, Jeff Kensrud, Eric Lang, Baseball Prospectus, December 9, 2014. NOTE: If you are not able to access the Baseball Prospectus article, you read it here. Alan M. Nathan, The Hardball Times Baseball Annual 2015.